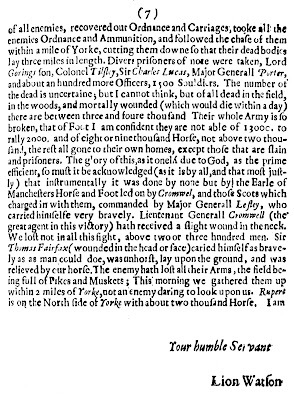 On 2 July 1644 the Royalists commanded by Prince Rupert and the Marquess of Newcastle engaged a much larger combined force under Lord Fairfax, the Earl of Manchester and the Earl of Leven on ground about 6 miles to the west of York. In what is probably the largest battle to have taken place on English soil, the Royalists were outnumbered 28,000 to 18,000. 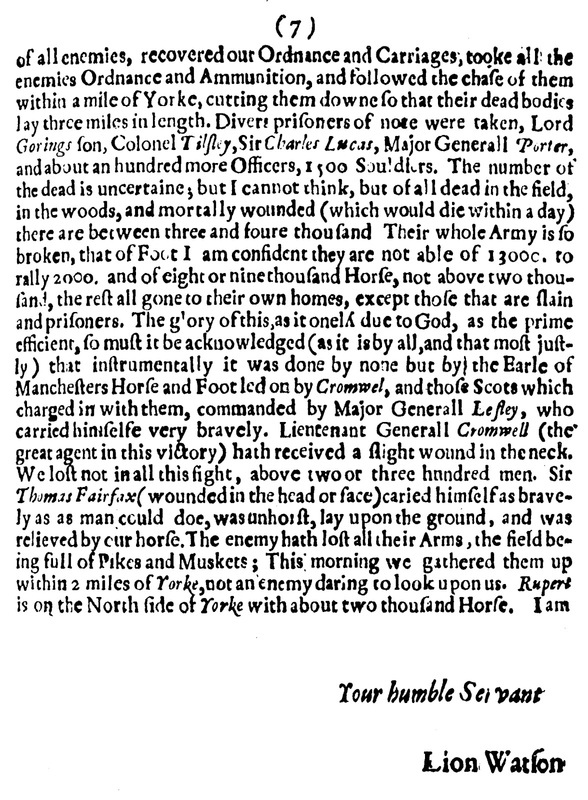 Amongst the Royalist forces were foot and cavalry regiments raised by Sir Thomas Tyldesley 1612-1651. Our three Brigades of Foot of the Earle of Manchesters being on our right hand. On we went with great resolution, charging them so home, one while their Horse, and then again their Foot, and our Foot and Horse seconding each other with such valour, made them flie before us, that it was hard to say which did the better our Horse or Foot. Major Generall Lesley seeing us thus pluck a victory out of the enemies hands, professed Europe had no better Souldiers. 1. A more exact relation of the late battell neer York; fought by the English and Scotch forces, against Prince Rupert and the Marquess of Newcastle. Wherein the passages thereof are more particularly set down, presented to the view of those who desire better satisfaction therin. Published for the more inlargement of our hearts to Almighty God on our day of Thanksgiving, commanded by authority for the great victory obtained. Allowed to be printed according to order., Lionel Watson, 1644.